Thank you so much for your interest in carrying my line of happy paper goods! I hope my products bring even more happiness to your shop and joy to your customers. Please see my wholesale policies listed at the bottom of this page. Show your hometown pride through colorful and happy art! 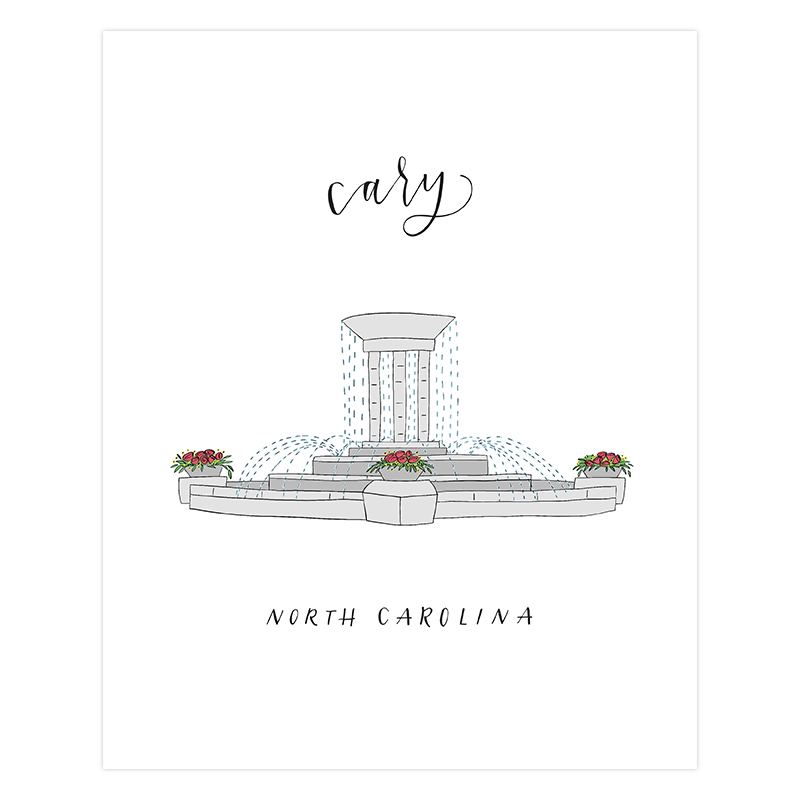 Customize the lettering on the art print to fit your hometown. Customize the lettering on the water tower (your city name) , the airplane flag (your city’s slogan) and your city & state name underneath the illustration. Email caitlin@happytines.com for your custom request. You will receive an invoice when the order is ready to ship. Once your invoice is paid in full, your order will be shipped. Non-payment will result in cancellation of the order. Orders are sent via USPS Priority unless otherwise requested. Local pickup is available upon request (Apex, NC). Shipping costs are additional and are the responsibility of the customer. Express shipping is available and a rush handling fee may be applied if you need expedited service not falling within our standard 2-week processing time. Our typical turnaround is approximately 5 business days, however turnaround times vary. Please contact me directly regarding your delivery date. Claims must be filed within 7 business days of receipt. We reserve the right to request photographs of any and all damage being reported. Notice of loss will be reported to USPS and items must be retained for USPS inspection. All product designs are the sole property of Happy Tines. Items are sold for personal use only. Replicating any Happy Tines product or using it in a way other than how it is intended is strictly prohibited and will be prosecuted to the fullest extent of the law.